What was this plane doing, circling Denver? [and from another] Mystery Plane that was Spotted Circling over Denver leaves Military Officials Baffled November 17, 2016 http://www.dailymail.co.uk/news/article-3944484/Mystery-plane-circles-Denver-leaving-eagle-eyed-residents-military-officials-baffled.html The unannounced flight appeared in the late morning and made several loops above the city at around 32,000ft. Some speculated the plane was an E-6B Mercury, also known as a TACAMO (Take Charge and Move Out), a Boeing aircraft developed for the US Navy as an airborne communications platform. They are used to deliver instructions from the air to US Navy submarines fleets via a transmitter and antenna. The TACAMO E-6B airplanes are equipped with dual trailing wires that serve as transmitter and antenna, transmitting in the very low frequency spectrum. [and from another] ‘Doomsday Plane’ Circles Denver during Covert Naval Mission November 18, 2016 https://www.rt.com/usa/367431-doomsday-plane-circles-denver/ The US Navy has confirmed that a mysterious plane spotted circling over Denver for at least an hour was one of its fleet – but says details of its mission are classified. [and from another] Very Low Frequency https://en.wikipedia.org/wiki/Very_low_frequency Since VLF waves can penetrate at least 40 meters (120 ft) into saltwater, they are used for military communication with submarines. Because of their large wavelengths, VLF radio waves can diffract around large obstacles and so are not blocked by mountain ranges, and can propagate as ground waves following the curvature of the Earth. VLF transmissions are very stable and reliable, and are used for long distance communication. [and from another] The Cabal will be Defeated no matter who Wins the US Presidential Farce November 7, 2016 http://benjaminfulford.net/ A special-forces attack on a Khazarian base in Denver that successfully stopped cabal efforts to steal the US election on behalf of their zombie proxy Hillary, CIA sources say. Is George Soros dead? If so, his death is being denied. Soros is on a hit list, sought by the same people who countered the election fraud attempting to get Hillary into the White House. There are many battles behind the scenes, and the truth is often one of the victims. Ben Fulford gives great insight into these behind the scenes trends and activities, but at times his sources are spectacularly wrong. His sources had Hillary dead on September 11, for instance, but later she returned to the trail with her wandering eye. On November 20 he stated his sources had Soros dead of a heart attack. 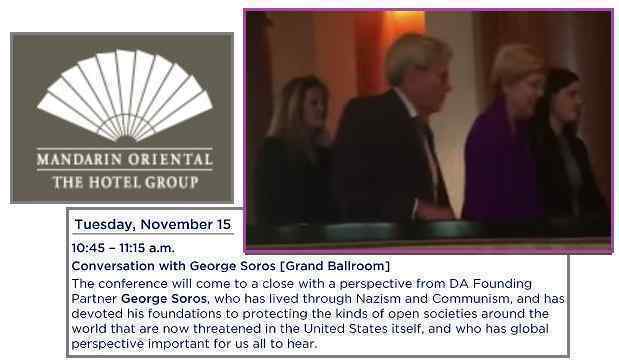 What is known is that a closed and very private conference was to start in Washington DC on November 13, lasting 3 days, and that Soros was scheduled to address the attendees on the last day, on November 15. Liz Warren had been invited and was caught on camera rushing into an elevator on November 15. Beyond that, no photos or reports have emerged as of the writing of this ZetaTalk on November 20. A Croatian newspaper reported on November 15 that Soros had died of a heart attack. Denials and cries of “hoax” were heard afterwards. Soros is 86, and certainly could have a heart attack given the recent setbacks to his agenda. Why would a Croatian newspaper be the first to break the news? 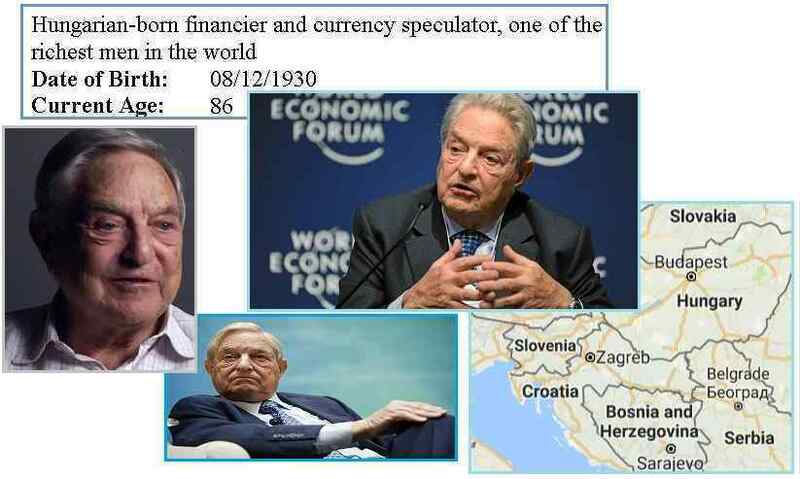 Soros was born in Hungary, next door to Croatia, and is likely the most famous personage from that region. Family, being informed, would contact family and friends in Europe, and the word gets out. Thus this Croatian article should not be dismissed out of hand. Why would a coverup be done? Those around Soros expected success in their personal endeavors based on the power of Soros, their great leader. They would delay the news forever if a double with sagging skin under the eyes could be found. Is Soros dead? Yes. He has had a mountain of setbacks lately, and more mountains before him. It did him in. In the wake of Donald Trump's victory, there has been a push for social media and online news outlets to more actively filter stories published by untrusted sources. The theory being that certain fake news stories were so widely disseminated that they may have influenced the election result. Is there anything more to this initiative beyond simple quality control? What do those in charge of social media and online news hope to achieve? Are there any implications for the impending Announcement? [and from another] http://www.abc.net.au/news/2016-11-14/fake-news-would-have-influenced-us-election-experts-say/8024660 During the election campaign, fake news about now President-elect Donald Trump and Democratic presidential candidate Hillary Clinton circulated online. Stories about Mr Trump calling Republicans the "dumbest group of voters" and Mrs Clinton accidentally paying the Islamic State group $US400 million were among those determined to be false by myth-busting website Snopes. [and from another] http://www.nytimes.com/2016/11/15/technology/google-will-ban-websites-that-host-fake-news-from-using-its-ad-service.html Google kicked off the action when the Silicon Valley search giant said it would ban websites that peddle fake news from using its online advertising service. Hours later, Facebook, the social network, updated the language in its Facebook Audience Network policy, which already says it will not display ads in sites that show misleading or illegal content, to include fake news sites. [and from another] http://www.abc.net.au/news/2016-11-20/facebook-outlines-steps-to-fight-fake-news/8040404 Facebook, which is currently facing withering criticism for failing to stem a flood of phony news articles in the run-up to the US presidential election, is taking a series of steps to weed out hoaxes and other types of false information. 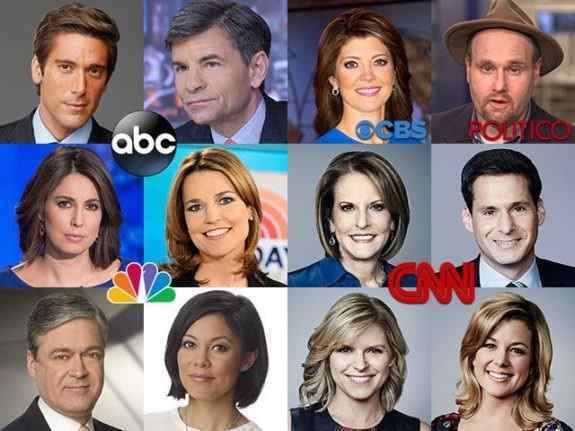 [and from another] http://www.infowars.com/ron-paul-reveals-hit-list-of-alleged-fake-news-journalists/ Former congressman Ron Paul revealed a list of “fake news” journalists he claims are responsible for “bogus wars” and lies about Hillary Clinton’s chances of winning the election. Journalists from CNN, the New York Times, and the Guardian are included. [and from another] https://www.rt.com/op-edge/367625-fake-news-post-truth-iraqi-wmds/ It seems the uneducated plebs are falling for ’fake news’ they read in ’new media’ and the lies of dreadful rabble-rousing populist politicians who are relying on people’s emotions, instead of ’objective facts,' to get votes. It’s all terribly worrying and poses a dire threat to Western civilization as we know it. Without a doubt the best, or rather the worst example of ‘fake news’ in the last 25 years or so, was the neocon lie that Iraq had WMDs in 2002/3. That wasn't peddled by ‘obscure bloggers’ and 'new media,' but by mainstream Western politicians, from ‘mainstream’ political parties, establishment-approved 'experts' on the BBC/ITV/CNN, etc., and Op-ed columnists in ‘serious’ and 'respectable' media outlets. [and from another] http://www.politico.com/magazine/story/2016/11/fake-news-media-facebook-214459 Some of the choicest slices of fake news, according to stories documenting them in the San Jose Mercury News, CNN.com, and the Washington Post, include reports that Twitter, Google and Facebook buried the FBI investigation of Hillary Clinton; that tens of thousands of fraudulent ballots for Clinton had been discovered; that Elizabeth Warren had endorsed Bernie Sanders for president; that Donald Trump had died; and that John Podesta had been practicing witchcraft. Snopes slays the most pernicious fake news. The fact-checkers at the Washington Post, Politifact, FactCheck.org and many other news operations correct the egregious violations of the truth. Fake news is nothing new, and to view the media as being fair and objective is to be naïve. All media has a spin, depending upon the preferences of the editors and owners. Money buys cooperation and where this does not succeed, threats are used. In many countries, the media is not allowed to operate, or in such a limited manner it is frankly described as being the state channel. The current shouting about fake news is due to the confessions that some in the media are making about the degree to which the media was skewed in a direction favoring Hillary. The guilty are now trying to point fingers at the innocent. CNN was so pro Hillary it was called the Clinton News Network. The Washington Post reportedly assigned 20 journalists to dig up dirt on Trump, yet the worst they found was a lawsuit by disgruntled Trump University students (who got their money back), comments about some women being fat, and typical locker room talk about how to make out with women. This received endless press while Hillary’s pay-to-play examples and careless treatment of highly classified email was buried. Hillary was giving away hundreds of millions of taxpayer funds and US weapons in exchange for riches for she and Bill. And no, the Clinton Foundation is not about doing good, as 95% of the funds went to the Clintons. It was a front, not a charity. Hillary was having seizures on camera, yet this was not allowed as a subject of discussion in the pro-Hillary media. She was fed the debate questions by a CNN insider. She had an obvious ear phone during a debate. The polls were cooked, the methodology adding so many Democrats to the mix that they showed Hillary winning. All these polls were presented with a straight face by the pro-Hillary media, so that when the anticipated election fraud stole the election for her, the public would not be surprised. Google arranged for pro-Trump articles to drift to the bottom of any search, while pro-Hillary articles would be perched at the top. Now we hear that the very villains in this blatant fake news narrative are going to help us understand that it was not they, but others, who were responsible! Snopes was and still is pro-Hillary. Google and Twitter only stopped their mischief when they were called on it by the public. CNN and the Washington Post were constantly talking up Hillary and speaking of Trump as though he were the devil. Now these media outlets are going to lead the public to the light, and explain what is and what is not “fake news”. Don’t trust them. It is clear from the charts that the Earth wobble has increased. First, despite Siberia being on the same latitude with Eastern Canada and Europe, there are vast temperature differences. The globe around the Arctic seems to be divided in half in this way at the current time. 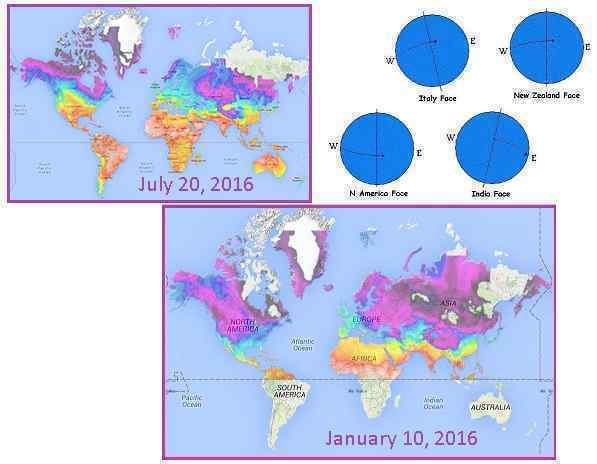 Just months ago, in July, we stated that the hot and cold regions in the Northern Hemisphere were divided into four parts, due to the Polar Push and Bounce Back, and the lean to the Left and Right. Now the increased wobble has created a duality, not the quadrant arrangement of the Figure 8 that had been present since 2004. The Polar Push wherein the N Pole of Earth is shoved away from the approaching N Pole of Nibiru continues to create cold temperatures in Siberia, where the magnetic N Pole of Earth currently resides. 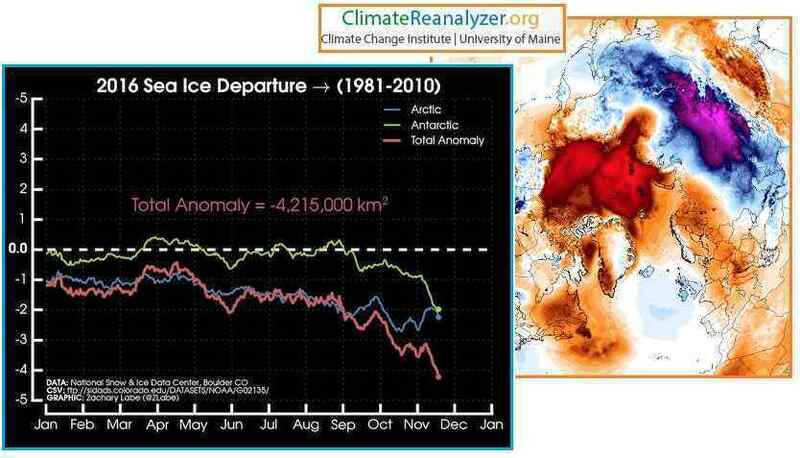 This has also warmed Antarctica, which is getting more sunlight. The Bounce Back is more fierce, so that Europe and eastern N America are also getting more sunlight, and thus the melting Arctic. What is missing is the temperature anomalies due to the tilt to the Left and Right. They have been lost in the more aggressive back and forth motion of the Polar Push and Bounce Back.